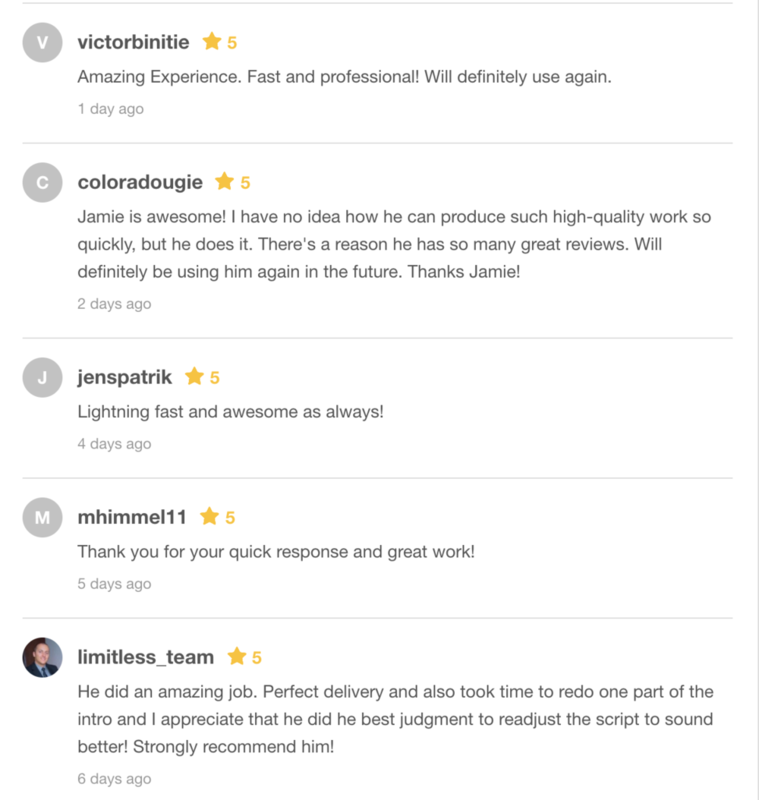 Jamie Buck provides complete voiceover and production of your Podcast Show Open and Show Close, along with additional Announcements, Commercials, Promos, Segues, and Imaging Elements. Over 500 Podcast Intros produced... and counting. 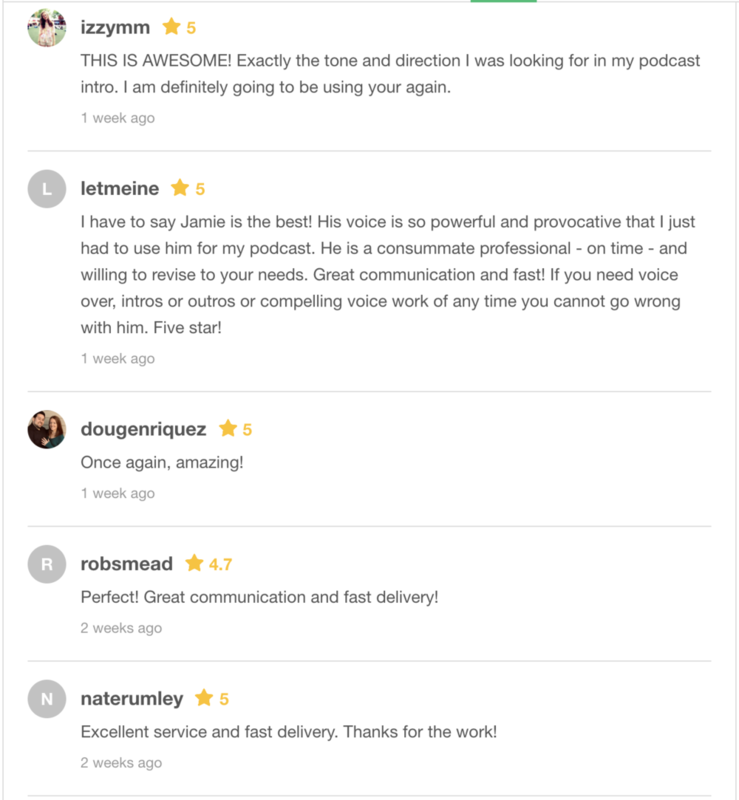 The choice is yours: Order podcast elements DRY (just voice over) or FULLY PRODUCED and MASTERED (voiceover with music and effects) ready to insert into your Podcast. Mobile users: Best viewed in landscape mode. Podcast Production including Podcast Intros, Outros and Bumpers. Professionally Produced. High-Quality. Podcasting Perfection. Proudly serving over 750 Podcast Clients. We offer 3 Packages for your Podcast Production. Please review samples from each package below to determine which bundle is right for you. While bookends (both an open and a close) are recommended, here are clients who chose to get their feet wet with just an Intro. Great starter package for those new to podcasting! Double your pleasure, double your fun. Podcasts sound best with bookends - an Open AND a Close. Most podcasts include an OUTRO that instructs the listener do something... A call to action. (ie. visit our website, like us facebook, subscribe to our podcast, etc). That's why we always recommend ordering both an Intro and an Outro. Kick it up a notch with our multiple production piece package! Get your Intro, Outro PLUS 3 Bumpers. These can be used for segments, features, promos or commercials. For the Pro Podcaster looking to stand out in a BIG way! For those who have more specific needs than just “basic production”. Custom Orders for Package D include extra voices, clips, drops, sound bites, extra sound effects, etc. If you can think of it, we can implement it! We can also help you with creative ideas. Since this package is wide to possibilities, and every client has different needs, rates vary. Please ask for a quote! Copy the MP3 link and get ready to paste in section 5 below. Tip: scroll down for a sample template to use as a guide for your intro and outro. If you would like us to write them for you, just indicate that here. a. MUSIC SELECTION: https://www.audioblocks.com/royalty-free-audio/music [Copy and paste MP3 link below]. b. STYLE. Feel free to list a sample above you like (ie. A3, B4, C2) c. VOICE TONE (serious, high-energy, light-hearted, etc). d. PRONUNCIATIONS. Names, Places, Abbreviations, Uncommon words? We have received your script and look forward to creating your podcast production. You can expect a return email or phone call within 24 hours to verify all your information so we can get started. THIRD: After submitting, look for a PayPal link sent to your email within 24 hours. Pay it and order will start! Need some inspiration for your podcast intro and outro script? We can help. Just attach the key points about your podcast that you want to get across, and we’ll take it from there for a nominal fee. Also, below is a FREE SAMPLE TEMPLATE of a standard INTRO and OUTRO. Feel free to customize to your liking. OUTRO: You've been listening to The PaperCityMMA Podcast. Be sure to subscribe on iTunes or Google Play to get fresh, new weekly episodes. For more, please follow us on Instagram, Twitter, and Facebook or visit our website at papercitymma.com. Until next time, Fight On! AND SO MANY MORE. On average we produce about 4-6 Podcast Productions a day. Take your DJ Gigs to a whole new level! Your Weddings, Bar/Bat Mitzvahs, Corporate Events, School Dances, Seminars, Conventions, Block Parties and Club DJ'ing will come alive with these professionally produced DJ Intros and Voiced Workparts. For Terrestrial, Satellite and Internet Radio Stations needing Voice-Overs and Fully Produced Radio Imaging, Jamie Buck delivers. Put his 20+ Years as a Rock Radio and News/Talk/Sports Creative Services Director / Production Director to work for you.